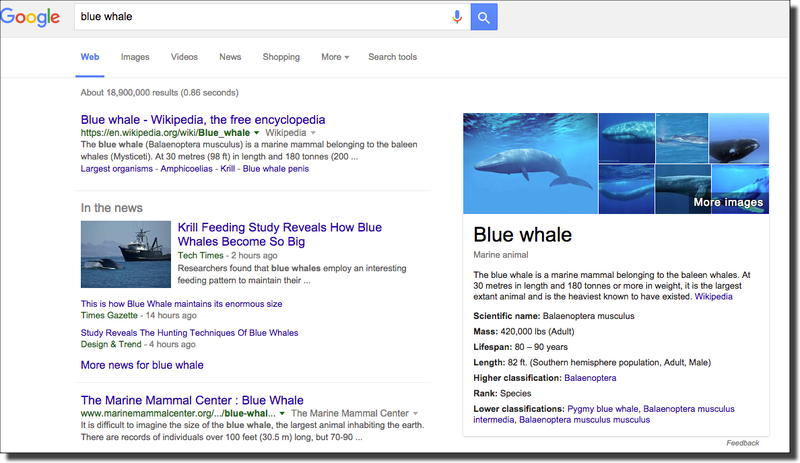 Search Challenge (10/28/15): Fake or real? How would you know? ... is a question that comes up fairly frequently when you're reading online content. We see news stories, social media posts, or images that flash by and make us wonder "Can that possibly be real?" This week's Challenge is to explore a couple of ways to check if something is real or not. This came up for me this past week when a friend posted the following image on his/her Facebook page and wondered how CalTrans was going to get all of that mud and debris off of I-5. 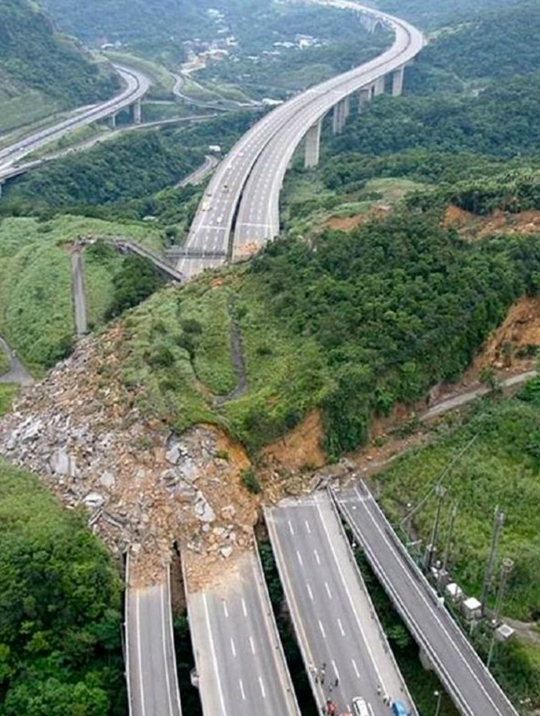 I'm originally from LA, and there HAVE been recent mud slides in the LA area on Interstate 5 (I-5) at a place called the Grapevine (so-called because it's a very twisty freeway through a narrow mountain pass). I've driven that section of road a lot in my life, and this just doesn't look like the Grapevine. So I wondered--is this photo real? This is what started me thinking: What methods CAN we use to tell if something is true and correct? What would you do? 1. Is that image above really from the recent (October 16, 2015) mudslides on the Grapevine (I-5) near Los Angeles? 2. 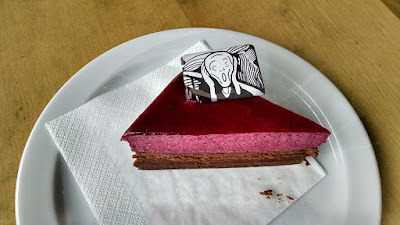 How about this next photo? Is this real? As always, please explain your reasoning and methods. HOW did you figure out if it was true... or a fake? Next week we'll continue this theme of "how to find fakes" with another kind of data! Let me know how you like these Challenges. I hope you find them as fun (and useful) as I do. Answers (and how I figured it out) next Monday, November 2, 2015. Answer: What are these signs and symbols? ... largely because I'm not sure I've been to a friendlier place. I had lots of conversations with people I met there--just chatting about life in Nova Scotia and what it's like to live there. But this week's Challenge wasn't about the conversations, it was about a couple of slightly obscure cultural details. I turned these into Search Challenges because I often find that questions like these are difficult to answer, usually because you don't know how to start. I mean, where do you start with this first Challenge question? To answer this question I just did the obvious first search, using terms that described what I saw. (Note that I didn't include the term "telephone pole" because I wanted to start broadly, and I wasn't sure if they called the pole a "telephone pole" or something else--better to start broadly and then narrow down). 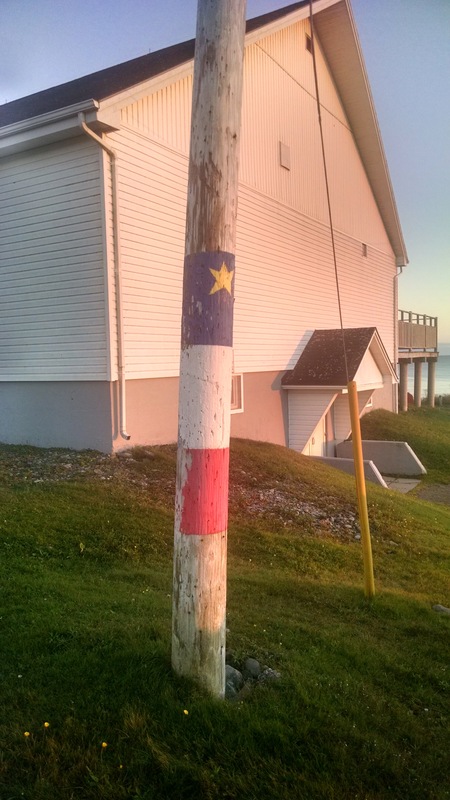 Luckily, this let me to the Wikipedia list of Canadian flags, which includes a description (and image) of the Flag of Acadia, which looks exactly like this telephone pole. (It's worth knowing that I saw this flag a LOT in the St. Peter's / L'Ardoise region of Nova Scotia. And, for confirmation, I found this flag on the inside of the building behind the telephone (in the image above). 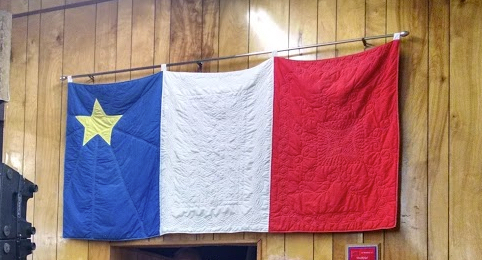 The name of the parish is derived from the former French colony of Acadia in Canada (which consisted of the modern provinces of Nova Scotia, Prince Edward Island, New Brunswick, and much of Maine) many of whose French-speaking inhabitants were deported to France and then migrated to Louisiana in the Great Upheaval (see Cajuns). I'll let you dig into the details here, but in short, the Acadians were forcibly expelled from the present day Canadian Maritime provinces of Nova Scotia, New Brunswick, and Prince Edward Island —an area also known as Acadie. This happened over 10 years (1755–1764) during the French and Indian War as part of the British military campaign against New France. The British first deported Acadians to the Thirteen Colonies (remember, this is pre-US), and after 1758 transported nearly all of the Acadians to the colonies, Britain, and France. Afterwards, many of them relocated to Louisiana, where the Cajuns trace their roots to the influx of Acadian settlers after the Great Expulsion from Nova Scotia. Since moving to Louisiana the Cajuns have developed their own dialect, Cajun French, and you can still hear the effects today. 2. More than once I heard a local say "..I'm going down to the north..." This struck me as funny because I thought the convention was that north was up. What could a Cape Bretoner mean by this phrase, "I'm going down to the north..."? I struck gold with that last one, finding that "...in some parts of the Western Isles of Scotland, it is not uncommon to hear islanders talking about going “down” to the north and “up” to the south." That's relevant because Cape Breton is ALSO populated with a lot of Scots who migrated to the area during the 1800s, so they well could have brought along this standard usage. "Cape Bretoners talk about Down North – diametrically contrary to most people who go “down south” and “up north.”... Let’s overlook the finer points of the compass! Let’s think wind. In the age of sail, if you wanted to sail Lake Bras d’Or from Baddeck northeast to Sydney, for the majority of your journey you would make use of the prevailing wind which blows most commonly from the southwest. Thus you would be sailing “down wind” and therefore (sort of) “down north”. Logically, therefore, on your return trip you would be sailing “up” to Baddeck against the prevailing wind.."
In this way I also found the book, Down North and Up Along, which describes going "down north" as applying to any journey northward from the southernmost point of Nova Scotia. 3. I visited a few small fishing villages and noticed that they have a particular kind of fishing boat. 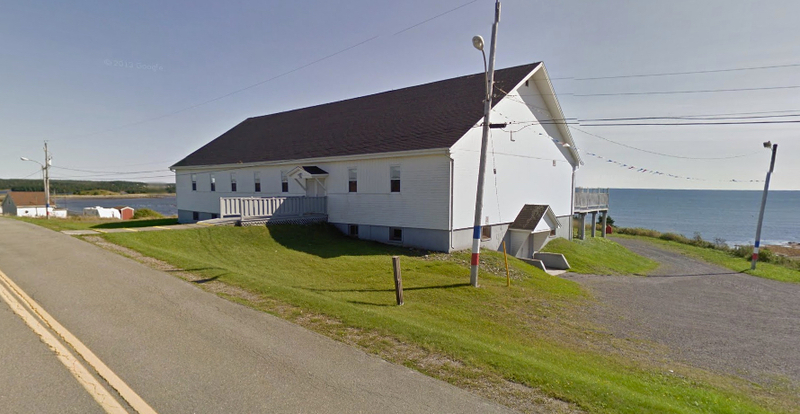 I wondered if this was particular to Cape Breton, or if it's more broadly distributed. So... what's a typical Cape Breton fishing boat design? and found lots of great results. Including this nice article at the Canadian Museum of History about Nova Scotia boat design. This tells us that Cape Breton fishing boats "...have a curved top cuddy and graceful, single shear." And that "...A distinct feature of wooden Nova Scotian boats was the hollow or built-down skeg; elsewhere builders made a solid wood deadwood. 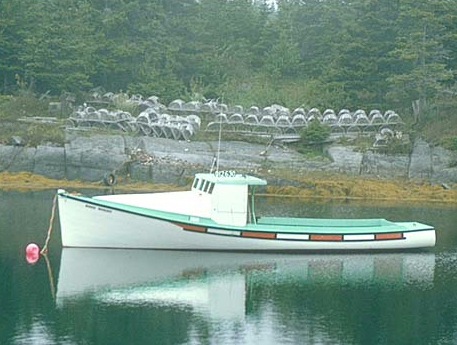 It was a lighter more buoyant hull and always a feature of "Novi" boats, as they were known throughout Maine." 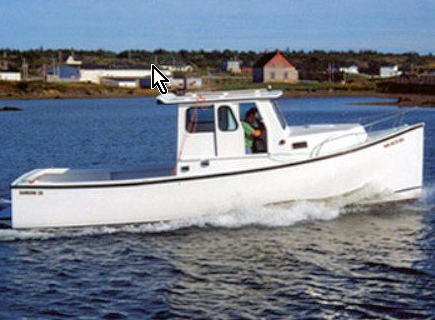 An Image search also shows some distinctive Cape Breton boats. Notice the nearly vertical bow, and the deck in the back. These aren't big boats, but the design is clearly Cape Breton. 1. Pay attention to the things you see in the world. I don't know about you, but painted telephone poles are an unusual thing to see, and when you see a bunch... well, you should start asking questions. Why? 2. A great way to find a song you heard on the radio is to search for a distinctive lyric... on YouTube. I'm always impressed at how well this works. In this case, I found that song I heard, in Cajun French, on YouTube. 3. Sometimes you just have to do a bunch of searches. When looking for the "down north" explanation, I probably did 12 searches before I found one that got me somewhere. I was able to do this quickly, just doing a broad survey of available results. A key thing to remember (especially if you're a student): Sticking with it sometimes takes a little time. But it's completely worth it. 4. Try going to a less restrictive search when things aren't working out. As you saw in the above example, to really get a good result, I had to NOT use double quotes, even though I initially thought they were necessary. Remember to try backing off (removing double quotes, or removing search terms that aren't as helpful as you believe) as a strategy. 5. 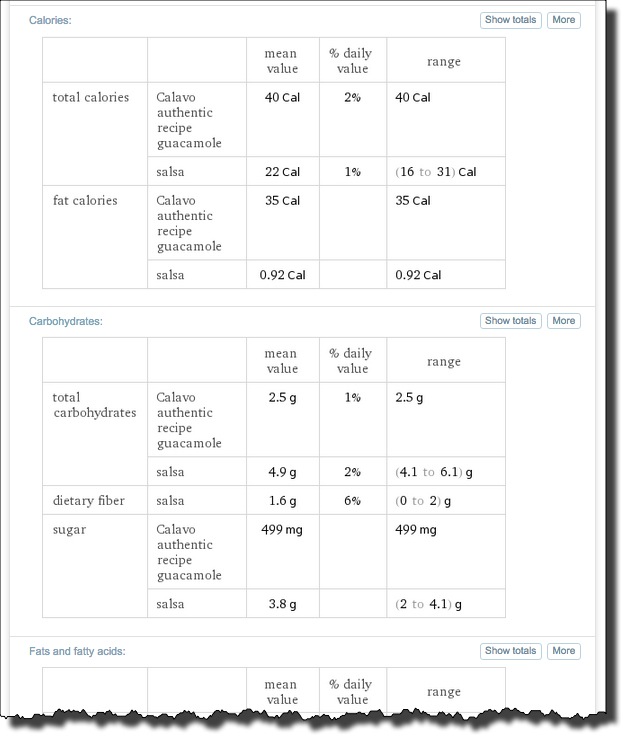 Contrariwise, sometimes you have to ADD in a term to exclude results that are getting in the way. That was the case when I had to add the term "design" to find information about Cape Breton fishing boats; it was the only way to actually get to results that were useful. 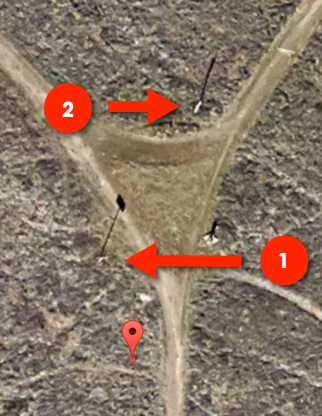 Search Challenge (10/21/15): What are these signs and symbols? ... is a beautiful place on the northeastern end of Nova Scotia. I was visiting there last week, driving around enjoying the local music and the fall colors. 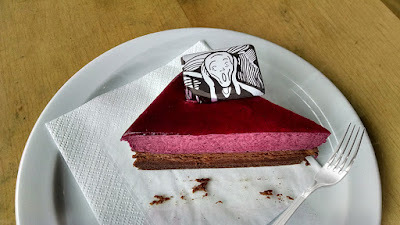 But as usual, there were things there that puzzled me--can you help me understand what I was seeing and hearing? These Challenges can be a little tricky, so I'm really curious about what you do to answer these Challenges. Be sure to let us know HOW you solved these! 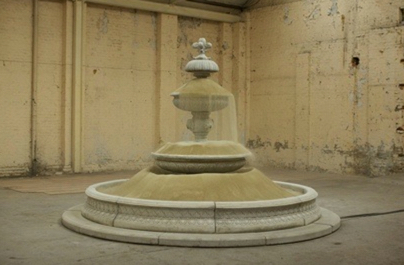 Answer: Fountains with something other than water? 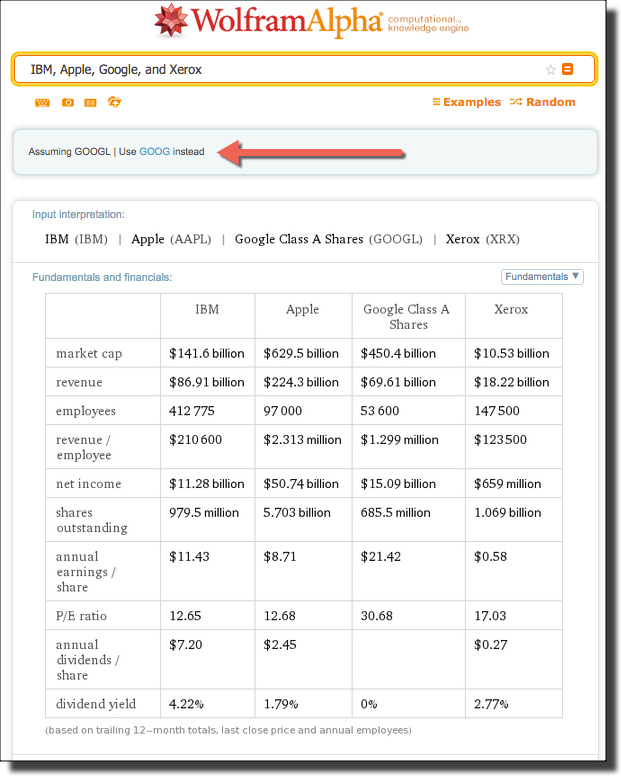 At least one person noticed that I used to work at the IBM Almaden Research Center in San José, California. The lab is named Almaden after the region where it's located, New Almaden, CA, which was in turn named after Almadén, Spain. 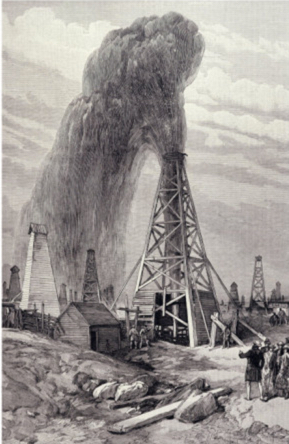 New Almaden was well-known for its large mercury mining operations, which supplied mercury for gold mining operations in Gold Rush-era California (late 1840's). 2. (extra credit) What would a strategy be for finding other fountains that use other "non-water" substances as their flowing / squirting / splashing element? 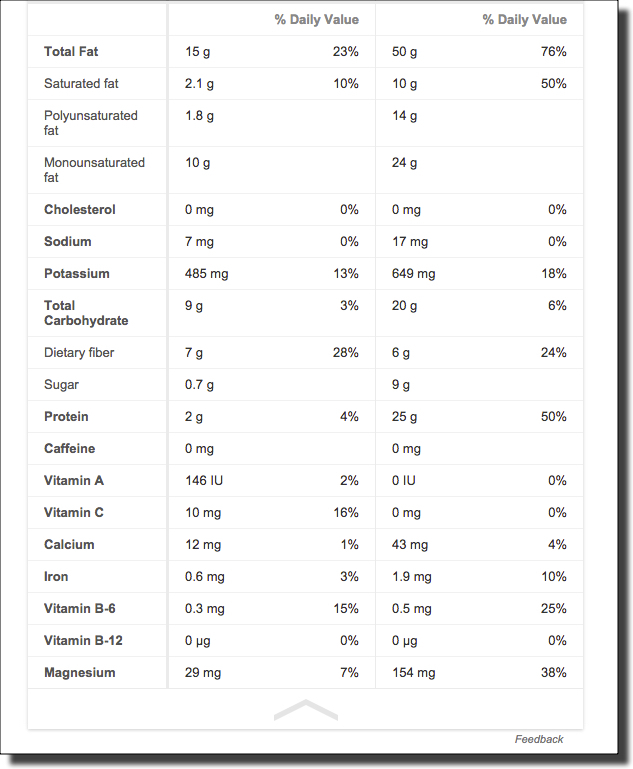 How would you find other things in this "non-water" category? This was a bit more tricky, and I still haven't found the perfect strategy, but here's what I did. but that wasn't so productive. There are too many low-quality hits. and that didn't work well either. Too many poetical uses of those terms near each other. I realized that perhaps a better solution would be to try and use language that would be in an article that talked about non-water fountains. I used the "a * fountain" to find articles about fountains that were of a particular kind, then added in the expressions that would most likely be used in articles that specifically mentioned that it was different than a water fountain. This approach worked pretty well. I found the mercury fountain (of course), but also mentions of hypothetical "codeine fountains" and ideas about "oil fountains" as well as "soda fountains," fountains of wine, vodka, chocolate, run, milk, lemonade, and--surprisingly--sand. Since this strategy was working well, I thought I'd try this same query in Google Books, hoping to find some really novel kinds of fountains that were well-described there. I had to minus-out the phrase "fountain of youth" because I was getting too many off-topic hits. Surprisingly, this strategy worked really quite well: I was able to find mentions of a "fountain of molten copper" in a concordance to the Qur'an, and fountains of blood, pitch, and bitumen described in an 18th century book, "The Universal Library, Or, A Compleat Summary of Science." The first Challenge was pretty straight forward. It's good to have these every so often--I mean, who knew that someone would be crazy enough to make a mercury fountain?? 1. Sometimes you want to use characteristic language in your search. In this case, the phrases "rather than water" or "instead of water" are going to typically be found in such descriptions because the article is describing an exception to the ordinary. 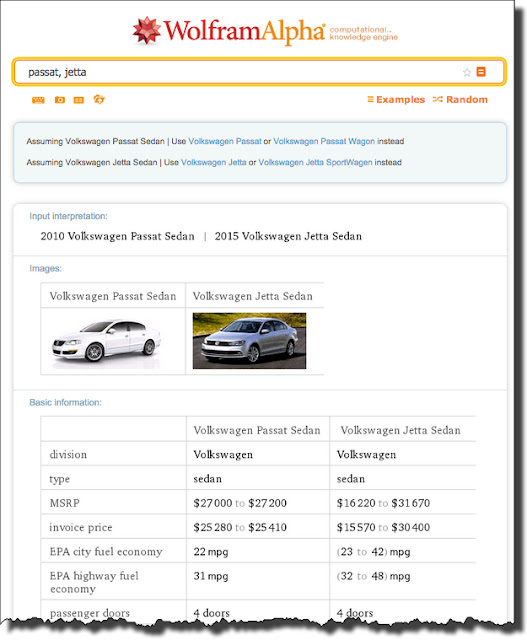 As always, the general idea is that you want to search for the language that will be in the web page you seek. Remember this when you're stuck on a really hard search task! 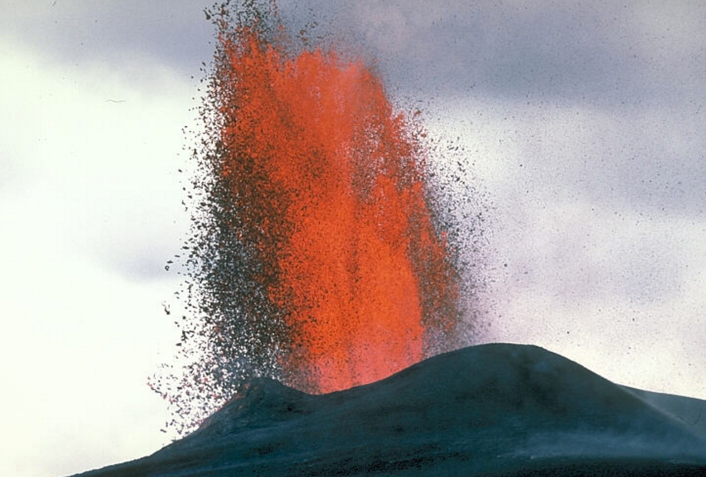 And at Pu`u` `O`o vent on Kilauea Volcano, Hawai'i. 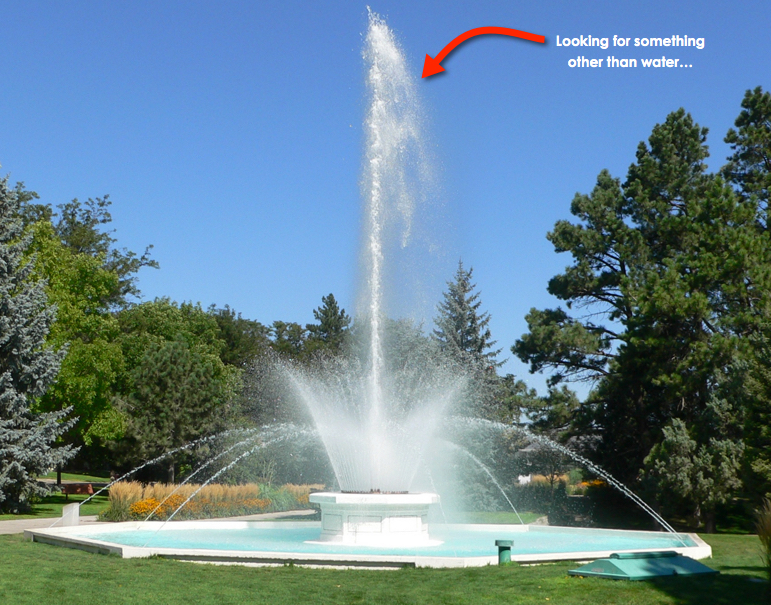 Search Challenge (1014/15): Fountains... with something other than water? This past week I saw a small fountain of molten chocolate at a hotel reception. You know, the kind you hold your skewered piece of fruit beneath, and then, as you try to eat it, the chocolate drips everywhere. If you're not careful, it will end up on your clothes and you'll be wearing an outer shell of solidified cocoa essence. But I also found out that fountains need not be just devices for shooting water (or chocolate) into the air. I've seen fountains of caramel (a VERY sticky mess), and even champagne. This week's Challenge is fairly simple, but can be as open-ended as you want. Let us know what you find, and HOW you found it! Answer: What does this sign indicate? ... are everplace in our lives; this just happens to be one that I got curious about. And as it goes with human cognition, once I saw this sign while running, now I'm seeing it just about everywhere I go. More generally, once you've solved a Search Challenge like this, you'll start to see LOTS of signs in the world that you do not recognize. One of the skills to learn in this Challenge is how to identify those previously unknown signs and symbols. As I said, it's just out in the middle of a field near a nice trail. 1. What does this sign indicate? Why would someone post this in the middle of an empty field? 2. What's up with the two trails to the south? Why are they there? 3. Can you figure out why that small caution sign is there in the middle right of the first picture above? What's the sign indicate? To solve this, I right clicked on the image (or Control+click) to get the URL for the image. I want to get the EXIF metadata from this image, and my first search after copying the image URL is for: [ exif metadata viewer ] (Remember this from an earlier SRS post?) 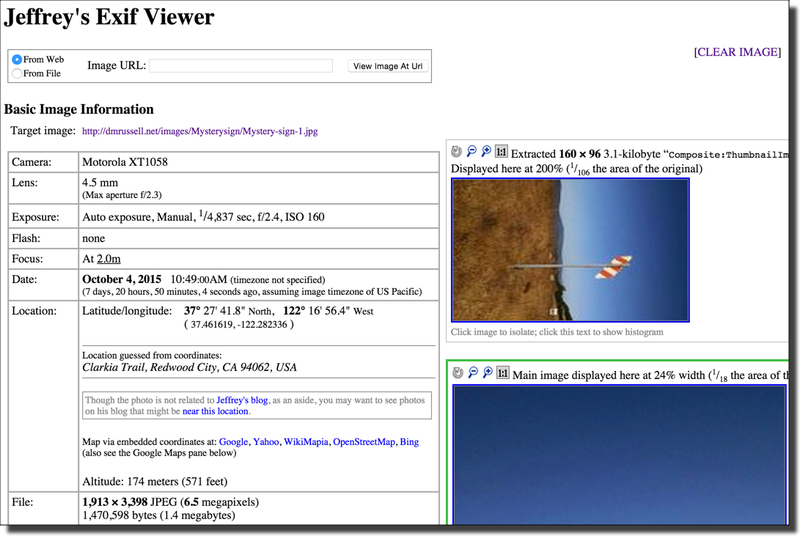 The first one on my results list is Jeffrey's EXIF viewer. and if you scroll down far enough, the app shows the map location. 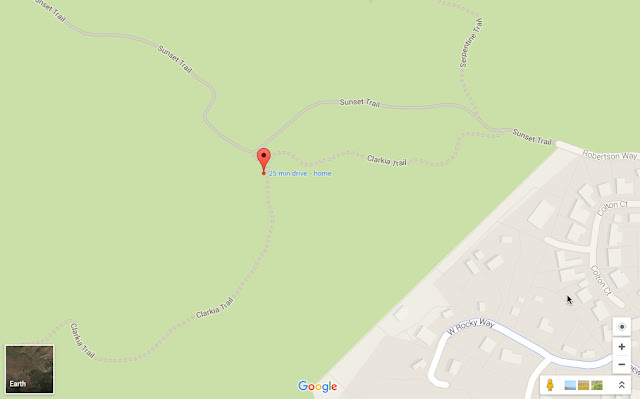 But here is also the "Location guess from the coordinates" (Clarkia Trail, Redwood City) and the lat/long: 37.461619, -122.282336. The red bubble is the location of the camera when I took the picture. If you zoom in, you can see the shadows of the sign... (number 1), and of another sign right beside it (number 2). Now... what's going on there? What could those signs indicate? This looks interesting--maybe it's what we're looking for in Challenge question #3! 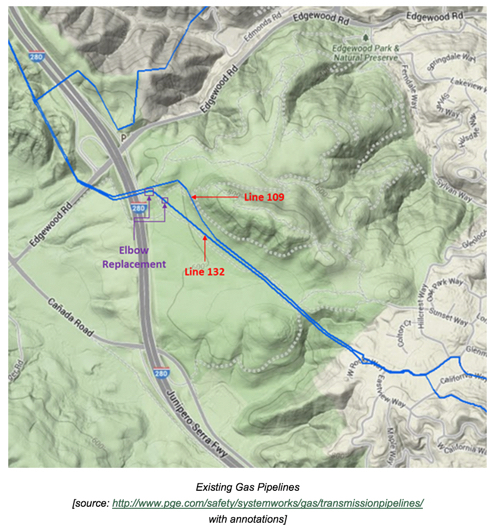 "Pacific Gas and Electric has begun hydrostatic pressure testing on the pipeline located in Edgewood County Park and Natural Preserve and will continue until mid-November, according to San Mateo County Parks Department officials. Work will take place in three locations along the Sunset, Edgewood and Serpentine trails and at the Clarkia trail junction. The park’s Sunset Trailhead will serve as the access point for project crew and equipment. Pipeline testing is expected to be completed in mid-November. Trails will be open during the project. However, periodic trail closures will occur when equipment, including PG&E and contractor trucks, must be moved. Signs will be posted on trails when this occurs, according to the Parks Department." 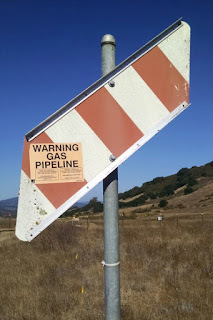 From this we get two big clues about the Challenge: First, that the sign in question might well indicate the presence of a gas pipeline, and second, that they will be posting signs when this happens. Note that the date of the posting is August 27, 2015--not that long before I took the photo. Can we find a map of the gas pipelines? FWIW, this is as close as the PG&E map will let me zoom. But you can see that there are 2 pipelines going right through the intersection of the Clarkia and Sunset trails. 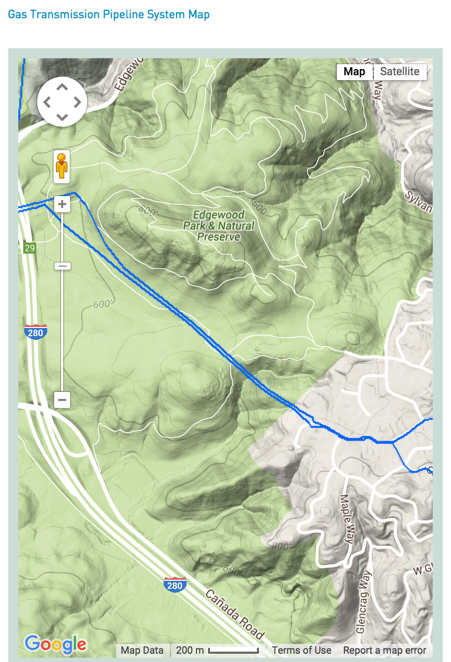 By doing a simple follow-up search, we can learn a lot about the pipeline through Edgewood Park. "PG&E is required by the California Public Utilities Commission (CPUC) to perform occasional safety testing on their pipelines. In the case of Line 109, the older of the two lines that run through Edgewood, this testing consists of removing gas from a segment of the line, then filling it with clean hydrant water, pressurizing it to 150% of the normal gas pressure, and assessing its integrity. This procedure is called hydrostatic pressure testing, or simply hydrotesting. In order to do this test, PG&E needs to access the pipeline by digging at 3 different locations inside the park (and at a 4th location just outside the park in Woodside). First sniff hole. 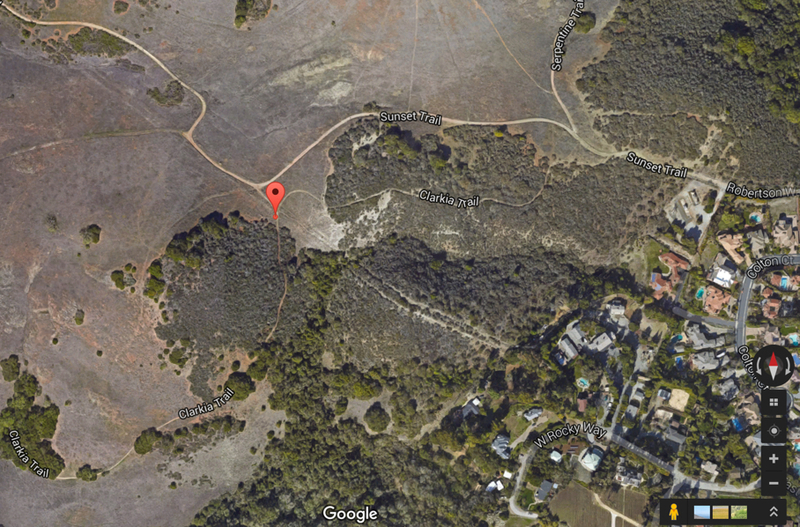 PG&E refers to this location as Location C. It is at the intersection of the Clarkia and Sunset Trails in map quadrant L-11...."
From the Friends Of Edgewood Newsletter. Now, what about the 2 trails? By looking at the Earth view up close, you can see that these are the tracks of pipelines 109 and 132. Section excerpted from PG&E map. But I digress. We've found the answers. 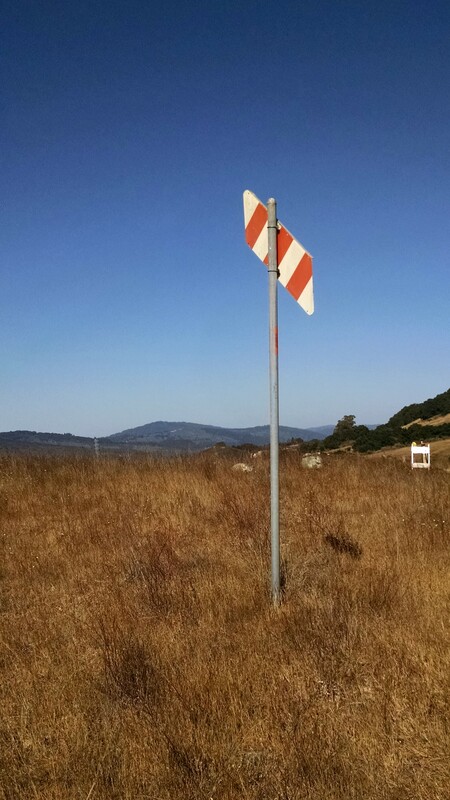 The sign is a marker for a high-pressure gas pipeline owned by PG&E. The two trails are the access roads for pipelines 109 and 132. And the caution signs on the trails are to mark the presence of sniff holes so the testing can proceed. 3. Image search for a marker is easy, especially if you know what kind of thing it's marking, OR the company name. 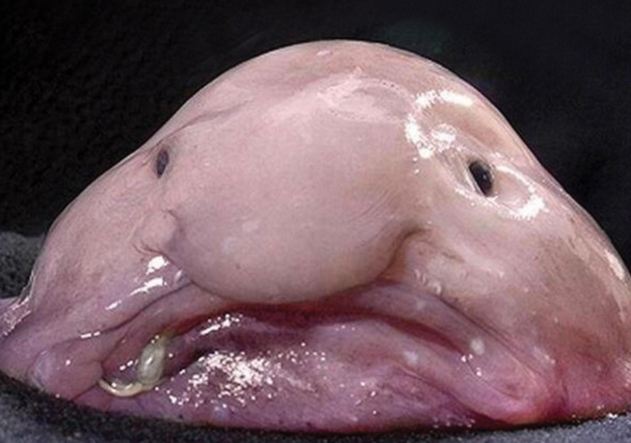 Interestingly, search-by-image was difficult to do with this image. I tried various clipping / cropping and nothing really worked well. But searching with a very descriptive query, [ orange white stripe sign gas pipeline ], actually worked very well. This was a great Challenge. Hope you enjoyed it as much as I did! P.S. And just as a bit of ground truth, here's a picture of the OTHER sign (sign #2 in the above Google Earth image). We were right! Search Challenge (10/6/15): What does this sign indicate? ... in a nearby open space preserve on the San Francisco peninsula the other day, I came across a somewhat mysterious sign. I figured this must mark something pretty impressive, because it's just out in the middle of a field near a nice trail. 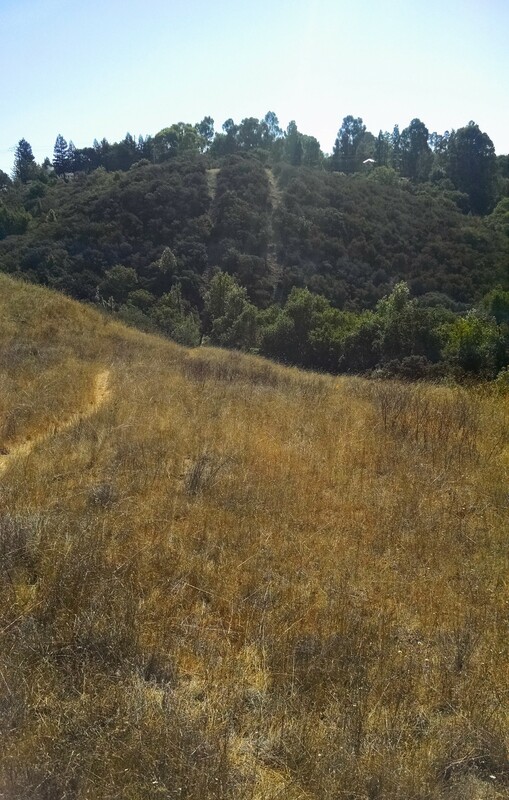 You can see the trail, and then on the hillside across the little valley, I can see two parallel tracks. They look like trails, but when I went over there, I found a fence blocking my path with a "no trespassing" sign. Huh. Naturally, I'm curious. Can you help me figure out what's going on here? This week's Challenge is about starting with one piece of information and then working from that to another, and another, and another. Any ideas? I found this to be pretty interesting, in part because I had no idea what these kinds of signs are all about, and it opened up a whole new whole of things I'd never thought about before. Hope you find this Challenge equally engaging. When you figure it out, be sure to tell us HOW you found out! "Thinking outside the box," I could be referring to any of many boxes that we get ourselves stuck in. As you know, there are lots of bias effects that can influence our problem-solving (or research) skills. We've talked about some of them before: confirmation bias (finding information that confirms one's beliefs while giving less attention to information that contradicts it), the availability heuristic (counting on immediate examples that come to mind when considering a specific topic), and functional fixedness (using something only in the way in which is typically described or thought-about). There is an important variation on these biases. Let's call it the common reference effect. It is the tendency for people to look first (and often, only) at the reference material that they commonly use. It's a little like the availability heuristic in that it's an effect of "using what you already know about," but it's a bit more than that. 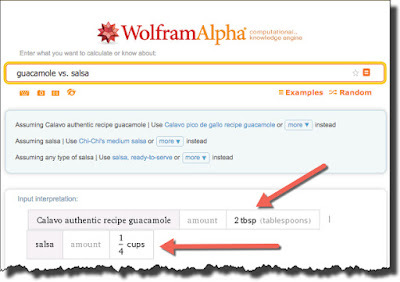 The common reference effect is when people tend to use the same reference materials repeatedly, even when it's more difficult to use or less-complete than another source. 2. 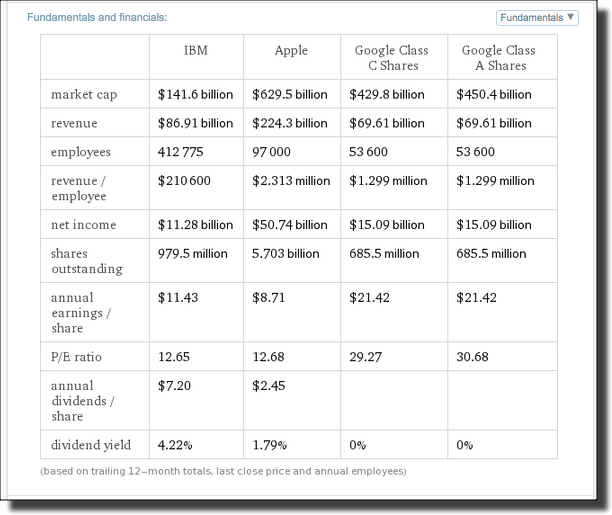 Can you compute the market cap, total revenue, and number of outstanding shares for each of the companies IBM, Apple, Google, and Xerox? As several readers pointed out, yes, you can search on Google for these questions. 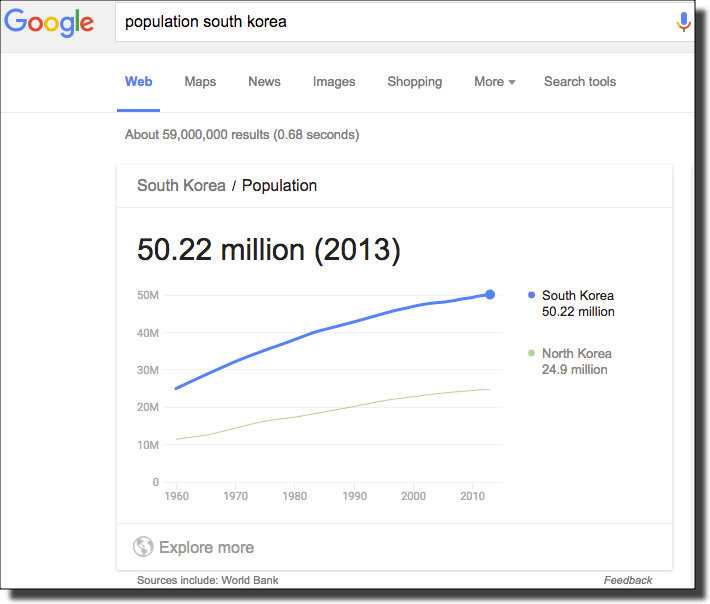 For instance, for the Koreas population question the simple query of [ population South Korea ] will give you a lovely chart that also includes North Korea. 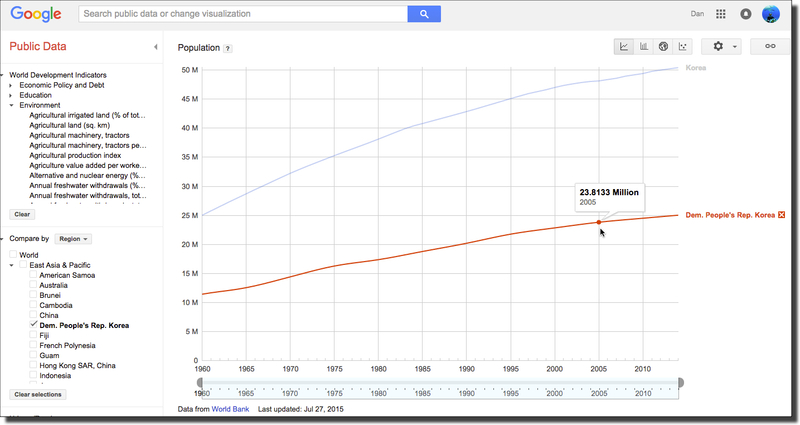 The second chart is especially useful because it gives the date of last update to the data (July 27, 2015) and the source (World Bank), and you can do various analyses with the data (e.g., compare to other countries or data sets). 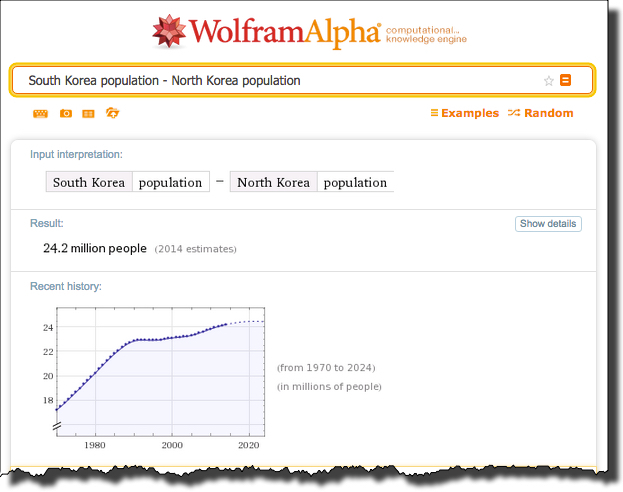 But it doesn't quite give you the difference between the two populations. A few more searches will get you the rest of the data (market cap, etc.). And naturally, if you do a search on Google for [ blue whale ] you'll get a bunch of great results, and a nice Knowledge Panel in the upper left telling you more about this particular whale (e.g., the largest animal to have ever lived--bigger than the biggest dinosaurs). 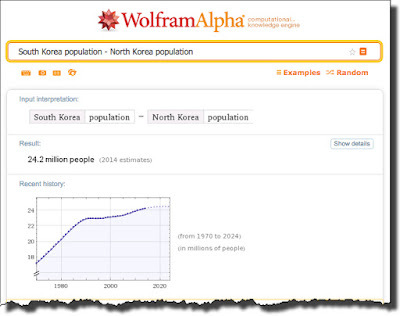 But as several regular SRS readers noted, the Wolfram Alpha search engine can do this fairly easily. In general, as SRS-ers, we want to be aware of what tools exist, and what their special and unique capabilities are. And one of the things that Alpha does quite well is side-by-side comparisons. But notice something here: See the arrows? 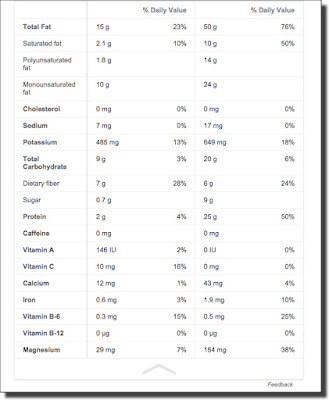 You have to be a little careful here--the amounts being compared are "one serving" (which can be very different). When you look at the rest of the chart below, be sure to remember that these charts compare 2 Tbsp of guacamole (28 grams) with 1/4 cup of salsa (65 grams... nearly twice the amount of guacamole!). In any case, from a SearchResearch perspective, this is the kind of tool we need to find these tables of comparisons. Alpha does a pretty good job here. Notice how I framed the query here--as a math expression. Alpha does a great job converting arbitrary inputs into mathematically meaningful expressions. 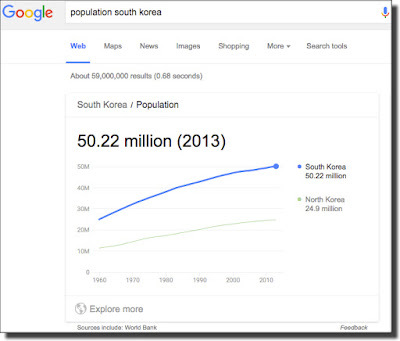 Notice in particular the chart is the DIFFERENCE between the two countries, and shows the change over time. An issue here is figuring out where the data actually comes from. 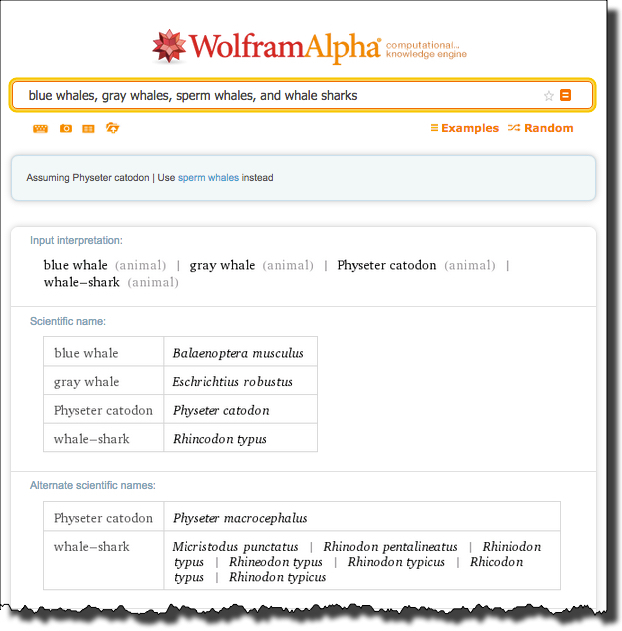 If you scroll to the bottom, you can click on the Sources link, which brings up a particularly unhelpful list, including that the "Primary Source" is Wolfram|Alpha Knowledgebase, 2015. That's a bit like saying "Because I said so..."
There is a pretty generic list below that of sources that the Knowledgebase draws upon, but it's pretty vague. 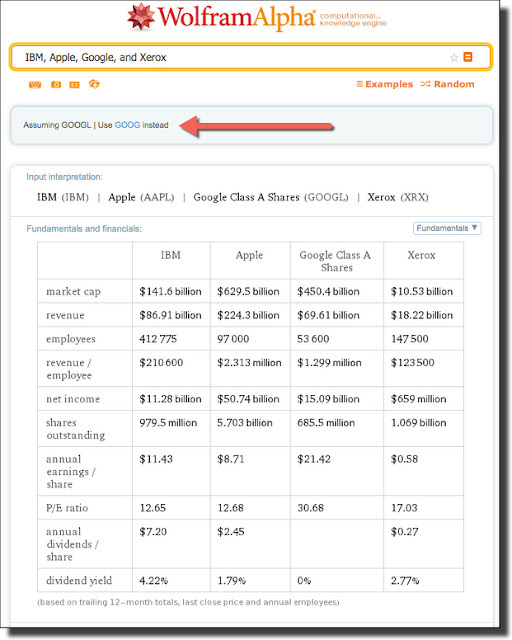 Financials: How would you do something like this analysis in Alpha? Again, read the fine print carefully. See that "Assuming GOOGL"? (Pointed to by the red arrow.) 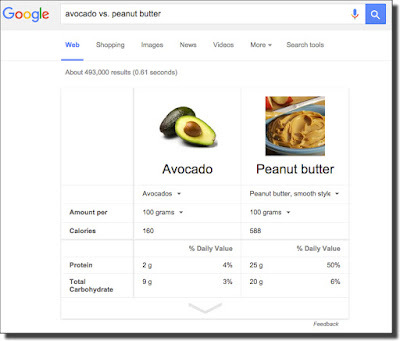 Be aware that when things like that show up (or in the Google results way above), they can be important. 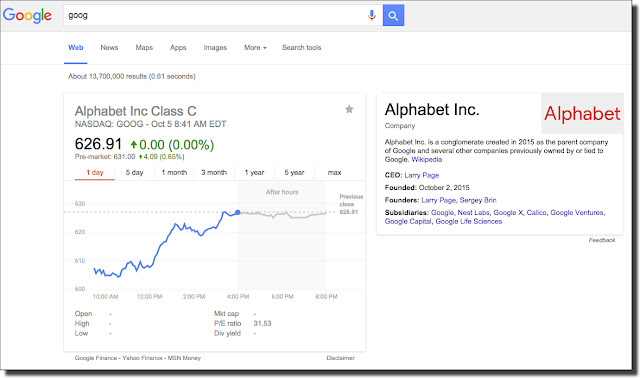 Google stock is now listed under TWO stickers: GOOG and GOOGL. To get an accurate picture, you need to consider both... notice where the values are the same, and where they differ. 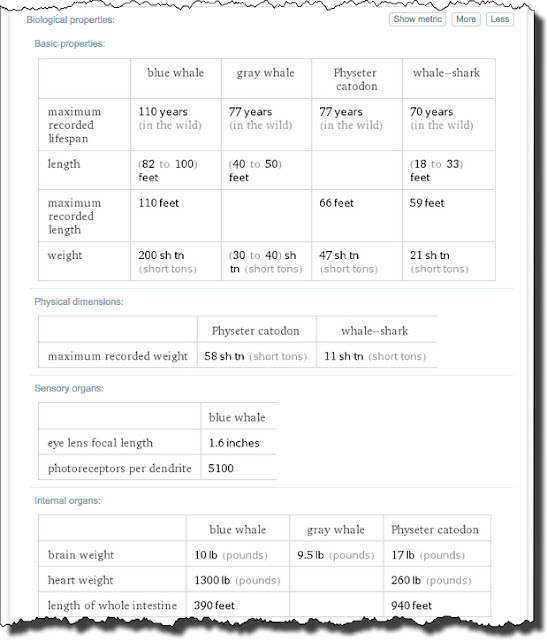 As you see, the side-by-side comparison tables are fairly interesting, and certain cover the lifespan, length, and weight we were interested in. The aspects of the tables can be somewhat random (e.g., "length of whole intestine"), but the capability of automatically generating side-by-side comparisons of different kinds of things can prove incredibly useful. Tools: As always, know your tools. Among its many capabilities, Alpha is GREAT about generating tables of side-by-sides comparing and contrasting different kinds of items. Common Reference Effect: Don't get trapped by the common reference effect. Great researchers know multiple ways to find information, and know what the strengths (and weaknesses) are of all of their data sources and tools. This was a fun Challenge! Thanks to everyone for their contributions!